I have the pleasure of doing the first razor review in this section of the website. This razor was given to me by a work colleague. Its really pretty to look at. Its slimmer than a slim adjustable. This is a three piece razor. With an Astra blade its shaves beautifully. Very smooth. Very mild. 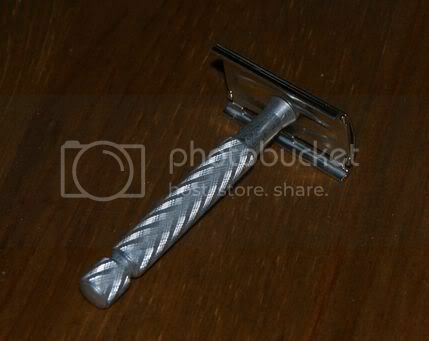 This is the razor I turn to when I want to be nice to my face. North of the Wall but South of the Frontier. Good looking piece of kit, Flatfish! Very good. I think this is what I got as part of a travel set. It's a lovely little razor, very light but easy to control with a nicely turned handle that refuses to slip despite being so stubby. I haven't managed to get too close with mine yet, but I haven't got my technique down and I've only used it with Wilkinsons so far but it seems like a fairly easy razor to get along with. I've just got one of these from Sunbury, and am very pleased with it. Are the slim handled Tech and the aluminium Tech one and the same? That is what I would refer to as a diamond pattern aluminium handled Tech (as opposed to a cast aluminium ball end Tech, or a (nickeled brass) ball end Tech) all of which are "slim handled" compared to the fat handled Tech at least. I recall using a few different aluminum versions years ago, and the heavier US made Techs were a bit different than the lighter aluminum ones. Oh, I'm guessing the 'slim handle' ones you mentioned are the heavier US made ball end razor. The Tech you have really isn't quite like most others in that group. There's a big difference in weight to start with. That means different balance and technique. Plus, you have a Tech with a head design that's not all that similar to most other Tech versions. It's obvious to see with pics what I'm talking about. Best thing is to use the amazing resource that Achim so graciously shares with us Take a look at the evolution of the Tech heads. The Tech you have will shave differently than most others and you should really try both. I'm not saying one's better than the other, since that would be for you to decide. Heh, that means you're gonna have to sample a different Tech sometime. Oh hell, I should maybe edit this: I looked closer at the pic in this thread and it's possible the head is an older version. Doesn't seem to have any bevel on the head from what I can see. Sadly, I just can't tell for sure. Sheesh. Then of course all the Bakelite and service issues also. Thanks guys, I would appear to have a catchily titled diamond pattern aluminum Tech! I'll be interested in what you think. I have what I think is an alu ball end and It rather shocked me when I tried it for the first time. "I would appear to have a catchily titled diamond pattern aluminum Tech!" It's a great easy going razor. Quite pleased with the new arrival. Seems to be a 1950's Ball end Tech with (I think) an aluminium handle. And with Slim Handled Tech. I can't say I've ever tried a UK made ball end, but the US ones are usually on the heavy side. There's a few later US aluminum models, but most would be brass and plated with whatever. I have that same razor as you and it weighs 59 grams. The fat handle version is 10 grams less and the aluminum ones are even lighter. Do you notice a difference between the two you have? Does one seem heavier at all? I can't imagine your ball end being made of aluminum, but who knows. I'd also be curious if you notice a difference in shaving performance. I thought the one I have was undated and from the 1940s-50s, but this one turned out to be an F3 (1960). Oh James, before I forget. There really isn't something called a slim handled Tech. That would actually be the ball end version. Do you notice a difference between the two you have? Does one seem heavier at all? I can't imagine your ball end being made of aluminum, but who knows. I'd also be curious if you notice a difference in shaving performance. Hi Martin, I was only basing that comment on the title of this very thread being "Slim handled Tech". I can't tell if it's made of aluminium or not, it does feel like it is but I'll investigate further, and read HERE in more detail. 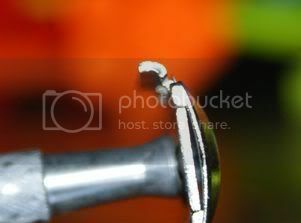 I've not used the ball end yet, but I'll certainly keep the thread updated as to how the two compare. Hi James, I think I have the same 2 razors in my stash. The Ball End has an aluminium handle and weighs 30g inc blade and the Slim Handled Tech also has an aluminium handle and weighs 29g. 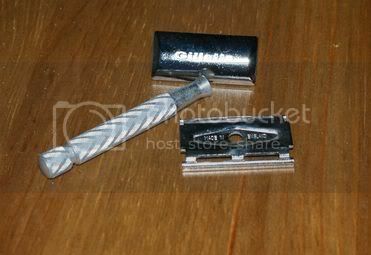 Both made in England , B.E has Gillette on head inside a diamond shape and S.H. just has Gillette on head. Both very light but seem to be good shavers when you get used to the weight...........or lack of it ?? I also have a UK alu ball end tech, very very light compared to the fat handle tech I bought from French, which is all I have tech wise to compare it to. I presumed it is cast alu as there seems to be a flash mark on the end of the ball, which seems to be backed up by Hunnymonsters quote on the other thread. I find it incredibly forgiving and mild and it has become my weekend / hangover razor of choice. The older USA Ball end tech (nickel over brass) weighed a lot more - but I no longer have it now. Yes it appears our Tech collections are the same! I've not weighed mine but they certainly feel the same as each other.I have had some good results with the Slim, but only one shave with the Ball End thus far.